It was a sorority filled weekend! Our first session was with Emily at the canals on Friday and it was amazing! 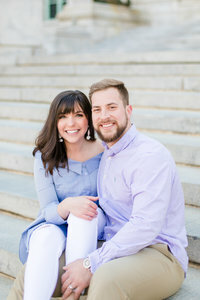 Our second of three mini sessions this weekend was for Spencer and Evan’s richmond anniversary session! We got up super early to meet these two at the State Capitol Building while the sun was still rising because the sun was rising BEHIND the Capitol Building, giving the front of it a beautiful glow from the reflections off of the surrounding buildings. You know those couples that just radiate joy? Well, Spencer and Evan did. just. that. For the majority of the session, I didn’t even have to guide them! They are actually just that cute and cuddly! Spencer and Evan, we loved every minute of our time with you two. The way you laugh together and the way you look at each other tells us everything we need to know about your relationship. We can’t wait for what’s to come for you two in the future. These are so beautiful Andie! Thank you Candace! You know I love my blues and marbles haha. Add a cute couple – the best!